Released in 1996 by EMI Records in three different formats: standard CD, limited edition double CD and limited edition quadruple LP. Did Iron Maiden really need to release a double "Best of..." album? The critics would say no. 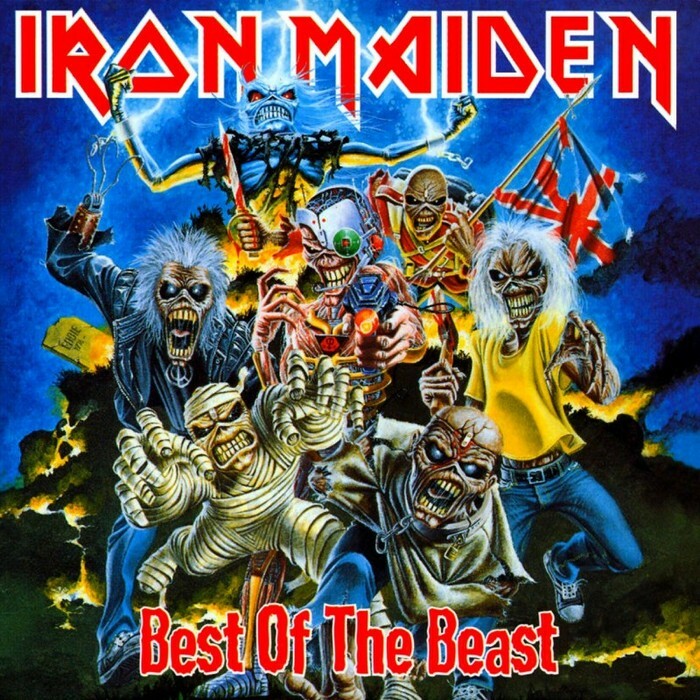 They labelled Maiden dinosaurs, irrelevant, and saw 'Best Of The Beast' as Iron Maiden exploiting their fans. Iron Maiden has never been a band to listen to critics. If they were, they would have given up after the self-titled debut. No, this release is a big middle finger salute to the self-appointed metal intelligentsia the world over. Like everything Maiden has ever released, this sold truckloads. The reason why it sold well may puzzle many. If you examine this release closely, a loyal fan would already have everything here, except perhaps "Sanctuary" (it was not originally included on 'Iron Maiden'). The first disc covers 1986 to 1996, which many fans think of as Maiden being past their peak. The second disc is basically a studio version of 'Live After Death' with a couple of extra tracks thrown in. So, what is the value in 2 1/2 hours of music you already have? Iron Maiden has consistently produced metal of the finest quality alloy since the 1970s. Iron Maiden has produced so many brilliant albums over the years, with fans all having their personal favourites from each album. If you want to listen to those favourites however, it can mean an avalanche of vinyl strewn across the room. Let's say you want to listen to "Iron Maiden", "Wrathchild", "The Number Of The Beast", "Aces High", "Wasted Years", "The Clairvoyant", "Bring Your Daughter...To The Slaughter" and "Be Quick Or Be Dead". That can mean up to eight albums to sort through. Why not stick 'em all on two discs and package them with a little hardback book mapping out Iron Maiden's history up to that time? Those who aren't Maiden fans will not understand why followers of the band would actually buy this. Fans of the band though, will understand. After all, you can't argue with seven incarnations of Eddie on a single cover. The Ultimate Iron Maiden Compilation, sadly out of print. In recent years Iron Maiden have gotten a reputation for cashing in on endless compilations all featuring more or less the same songs, but back in the day when they released their very first proper compilation, they already had ten studio albums under their belt. Very few bands have had the guts to wait that long. Having been released in 1996 this set of songs obviously misses the return of Bruce & Adrian, but the era it does cover, it covers brilliantly. The Standard Edition CD is a rather plain greatest hits collection with one obligatory new song, Virus, which is one of the best Blaze era tracks with its killer melodies and slow build-up. But back when I got interested in Maiden, I was still able to find the Double CD edition of this, which had some real treats on top of the hits. For a beginner it was a perfect package to start with. All the essential Maiden classics spiced up with a few live selections and even two tracks from their very first studio session for The Soundhouse Tapes EP. Afraid to Shoot Strangers is a Bruce era song sung here by Blaze, and in its subdued emotionality it is one of the few Bruce era songs Blaze managed to really make his own. Another live gem of this edition is Rime of the Ancient Mariner from Live After Death. I've always found this version superior to the already fantastic original. Bruce can't hit that siren note of his, but listen how the soloing section after that takes off - one of my favourite Maiden moments ever. The super rare 4 LP version adds even more brilliant album tracks to the mix, for example Seventh Son of a Seventh Son and Revelations, and to top things off, the entire Soundhouse Tapes EP along with the outtake Strange World. This is stuff that every serious Maiden fan should hear. 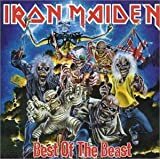 Hopefully from now on they hold back any further compilations until the end of the band, when they should bring Best of the Beast out again with an added third CD covering the rest of their career. 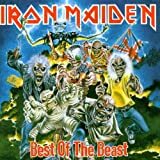 No IRON MAIDEN BEST OF THE BEAST reviews posted by members yet.